This article is presented on the basis that the reader is already somewhat familiar with the nature of VPNs and the type of services they provide. Ascertaining just which VPN service is best, out of the many available, is nigh on mission impossible. Reason being that none of the more popular services offer any sort of free trial period. Some offer a 7 or 30 day refund if not completely satisfied, however, during my research, I’ve read plenty of user reports claiming that this refund process can be extremely problematic. In an area which epitomizes the “try before you buy” dictate, this lack of free trials is extremely disappointing. Apparently, the only way to test these VPN services is to purchase a minimum plan, usually one month, and then decide at the end of that period whether you wish to continue on or not. However, considering there are at least five or six popular VPNs to choose from, plus the fact that these monthly plans are by far the least economical, testing and comparing all potential contenders prior to making any long term decision could easily turn into an extended and quite costly exercise. What follows then is a general guide to hopefully help you choose a VPN which is right for you. 1) ZERO LOGGING: This is absolutely one of the most important aspects of a VPN service. If your VPN is maintaining any sort of personally identifiable records, your privacy/anonymity is seriously compromised. Put simply, it all but defeats the purpose of using a VPN in the first place and you may as well just stick to connecting through your ISP. 2) DNS LEAK PROTECTION: Most would be aware that VPNs obfuscate a user’s real IP address but another important consideration that you may not be aware of is the DNS address. If the DNS address is associated with your ISP when connected through a VPN, your privacy/anonymity is at serious risk. You need to ensure that the VPN either automatically utilizes its own DNS server or includes an option to enable DNS leak protection in its client software. 3) NETFLIX and TORRENTS: While neither I nor DCT condone piracy in any form, it is a fact of life that many people look at VPNs specifically for circumventing Geo-blocking (Netflix) and hiding their TV show and movie downloading activities (torrents). The Netflix situation is currently extremely fluid with some established VPNs already blocked through the media streaming service and many others on the radar. Bear in mind that even if a VPN currently claims to allow access to Netflix, this may not necessarily be so. The only way to be 100% sure is to test the VPN through Netflix yourself. Even then, what’s true today may not be so tomorrow. On the other hand, most VPN services make it quite clear whether or not they support P2P (torrenting). Many do, some do not, and others impose limitations. If this is one of your primary reasons for using a VPN, you need to make sure to choose a service which includes unlimited torrenting. 4) SPEED: All VPNs impact negatively on internet speed to some degree. This is due to a combination of factors including security measures (encryption) and proximity to the VPN’s servers. Ascertaining an accurate level of impact on your internet speed when connecting through a particular VPN can only be achieved by actually testing that VPN’s service firsthand. To cloud the issue further, all VPNs make pretty much the identical claims – we are the fastest, we are the best, we are the most secure, etc, etc. Which brings us right back to that general lack of any “try before you buy” scenario mentioned earlier. One way to help overcome this issue is to choose a VPN which provides access to a plethora of servers worldwide, the more the merrier. Or, at least, a VPN which includes a number of servers based in close proximity to your physical location. Bear in mind that distance from the chosen server plays an important role in internet speed. The further the server is from your physical location the greater the impact on your internet speed is likely to be. Conversely, choosing a server closer to your physical location will likely have far less impact on your internet speed. 5) KILL SWITCH: While not exactly imperative (more on that later), the inclusion of a kill switch is definitely a bonus. A kill switch will completely disable the internet if the VPN connection should drop out. 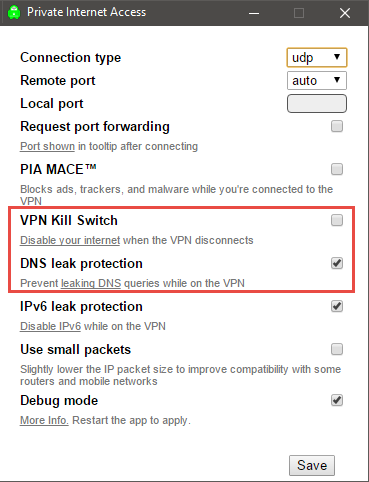 Without a kill switch, if the VPN connection drops out, your ISP connection will take over and your privacy/anonymity is out the window. I guess you could go through the protracted and somewhat costly exercise of testing each contender firsthand over the minimum period of one month or, perhaps, do as I did and spend about 3 to 4 weeks researching. I spent countless hours online reading reviews, both editorial and user, with the emphasis on user comments and… ended up going with the least expensive. I guess the scrooge in me won out in the end. Seriously, it is far from an easy decision. With all the popular VPNs, you can read a positive here and a negative there. However, on the balance of positive reviews and user comments, I decided to go with Private Internet Access (PIA). Sure, I openly admit that the low cost was a definite factor, but hey, if you’re going to take somewhat of a gamble, it may as well be with as little money as possible, right? As you can see from the above screenshot, I have not yet enabled the kill switch option. That’s simply because, to date, PIA’s connection has proved to be rock solid. It’s pretty quick too, I can honestly say that I am pleasantly surprised at how little impact connecting though PIA has on my internet speed. I apologize for not having the answer to the question posed by the title of this article, but having neither the time nor resources to test each and every VPN contender to its fullest extent, I am sorry to admit that I cannot state definitively which is the best service. I might also point out that, with many individuals seeking a specific feature or features, there is a certain amount of subjectivity involved. However, I hope you’ve learned something about VPNs along the way and, based on firsthand experience, I would definitely recommend PIA – with the one exception, not if you are specifically looking to circumvent Netflix’s Geo-blocking. Then again, in the not too distant future, that may well be the case with all VPNs. Suggested Further Reading: Is Your VPN Leaking? Very impressive article Jim. I’ve been using CyberGhost https://www.cyberghostvpn.com/en_us for over two years. It’s gone through many improvements, does have a FREE version, and using the supplied link one can see all the features, but unless you purchase it during one of their specials, it’s expensive (taking currency conversion into account). On the other hand, if you user browser is Firefox or Chrome, there is an addon which gives you FREE VPN service (but not for all types of surfing). Check out https://www.anonymox.net/en . Free version has limited servers, but for those wanting to wet their feet using a VPN, something to try out, Mindblower! Hi MB – Yes, CyberGhost is very expensive here. Unfortunately, the site doesn’t appear to include a feature comparison twixt the free and commercial versions. All it says is that the commercial version is 5 times faster than the free version. I like the sound of anonymoX. As you say, especially for people looking to wet their VPN feet. Thanks for the suggestion, appreciated. In my opinion, provided one chooses a VPN with an absolute zero logging policy, jurisdiction is of little concern. How can a VPN be compelled to hand over information if there is zero information to hand over? Conversely, if a VPN is logging anything at all, the user’s anonymity/privacy would be seriously at risk regardless of what country the VPN is based in. Agree with your reasoning that is based on a strict application of the “zero logging policy”, but is this well the case? The terms and conditions included in a VPN’s statement of policy are legally binding and, as such, open to a law suit if proven to be false. So yes, generally speaking, if a VPN claims a zero logging policy, you can pretty much take that as gospel. It’s also the reason I included the link to Torrent Freak’s reference library of VPN logging policies – for potential users to make sure/double check. I might add; anyone who expects that covert government surveillance is restricted to a specific group of countries would have to be naive in the extreme. Thank you for the clarification Jim. No, the VPN software is installed on the device. However, most of the popular VPN services provide free software, included in the subscription, for a limited number of different devices. For example; PIA allows for up to 5 devices to be connected simultaneously and provides software/apps for same, including Windows, Linux, iOS, and Android, all included at no additional cost with a single subscription. NOTE: In some cases, the router can be configured to use a VPN but these routers require specific firmware/features and the process of setting it up is far from simple. He is some disturbing news folks. http://www.extratorrent.cc/article/5579/it+s+official+your+isp+will+now+sell+your+web+browsing+history+personal+data+and+habits.html and read the sorry news, Mindblower! I thought Jim made this article due to that news topic. Either way, I don’t find my life important enough to worry about it. I used to be under the Tin Foil Hat but it got annoying over time. What I find most disturbing is Representative Michael Burgess’s statement that this move would “level the playing field for an increasingly anti-competitive market“. Meaning that allowing ISPs to collect and sell user data would place them on the same level as mega internet presences such as Facebook and Google, who are already collecting and selling data. In my opinion, this is exactly the reverse of how the politicians should be thinking. If they want to ‘level the playing field’, they should prevent everyone, including the mega online presences, from collecting and selling data. That would then achieve the same goal while leading to a reduction in privacy violations, not an increase. Anyway, no doubt this news will have VPN companies laughing all the way to the bank. Did you consider. Vpn. Unlimited? They have a lifetime deal. As far as I am able to ascertain: VPN Unlimited has a number of security issues which are cause for concern. Poor customer support. Nowhere near as many servers across as many countries as other services provide, and issues with WebRTC leaks. I am a firm believer that as long as you are connected, depending on what you may be doing and how bad a certain party wants to track you, you can be tracked VPN or not, I believe they all “log” to a certain extent for law enforcement purposes, hell, it came out a few weeks ago that the NSA even has Tor figured out when WikiLeaks dropped the Vault 7 bomb, so realistically you really cannot hide your IP, if someone or some entity wants it bad enough it can be tracked and had. I am a firm believer that as long as you are connected, depending on what you may be doing and how bad a certain party wants to track you, you can be tracked VPN or not. I tend to agree Ed. However, connecting via a VPN certainly doesn’t make things any easier for the trackers. I believe they all “log” to a certain extent for law enforcement purposes. That’s your prerogative. However, “all” is, in my opinion, incorrect. Some, yes, but not all. Great article with some very important points about choosing a VPN. I seem to remember you are living in Australia? Were any of your decisions in your final choice based on that fact geographically apart from your key points written in your article? I to have been going around in circles looking for a suitable VPN, and like you live here in Australia and find that most VPN’s seem to spruik the same snake oil. Speed would be an important factor for me in making a final choice along with your other key points. Hi John – Yes, I am in Queensland. As I said in the article: “Or, at least, [choose] a VPN which includes a number of servers based in close proximity to your physical location“. Unless specifically looking to circumvent geoblocking by connecting to a server in a different country, the best speed will generally be achieved by connecting through servers based in your own country. So, make sure to choose a VPN which includes a number of servers based in Australia. PIA is one. Thanks for that, I’m in Adelaide and am soon to have NBN in our area. I wonder if that will have any impact on VPN’s? I shall check out PIA………..
NBN is merely a superior method of delivering broadband to your home, via fiber optics. So, the only impact on VPNs should be positive, as in faster speeds. It easily bypasses our Great Firewall of China…!!! Whereas….PIA,Cyberghost,NordVPN & Mullvad get blocked by the firewall giant…. “ThatOnePrivacySite” compares 180 VPN services and takes into account many factors. Click on the VPN Section, and the Simple Comparison Chart shows alot at a quick glance. That’s a terrific resource Keith, thanks. However, I remain unconvinced that the emphasis this site places on the 5, 9, and 14 eyes nations is warranted. To me, zero logging is by far and away the most critical element, regardless of where a VPN is based. Though, I have to agree with Jim – for me: logging is the most important factor when choosing a VPN. There are lot of very favorable reviews/comments regarding ExpressVPN, but boy they are expensive! Note that the top 3 mentioned on the site you linked to are all near enough to double the cost of PIA. While it’s fine for reviewers to nitpick over minor details when they’re rating these services, in then end, the money is not coming out of their pocket, is it. Try this VPN for free or paid subscription. I ended-up buying the service for a year. The cost is reasonable. It would be a bit hard to try it when I neglected to insert the url–duh. I neglected to mention they have excellent service too. Interesting! The Windscribe service is NOT cheap but it is the first I’ve come across which offers a decent free version. Only 8 locations available and no OpenVPN (which is the most secure protocol) but 10GB/month free is more than enough to give it a good try out. And if you follow this link you can get 50GB for free at the moment. Some may find the article, “Post-FCC Privacy Rules, Should You VPN?” by Brian Krebs (Krebs on Security) useful – https://krebsonsecurity.com/2017/03/post-fcc-privacy-rules-should-you-vpn/ (he also references the Simple VPN Comparison Chart from That One Privacy Site, mentioned above).